An international team of researchers and scientists from the USA and China has sequenced the genome of proso millet, world's most drought-resilient crop grown mostly in the American Great Plains, northern China, and parts of Europe. Millets grow in infertile soils with less water than any other grain, and is popular among subsistence farmers in ever-hotter, drier swaths of Africa and Asia. However, low yields combined with traits that make them difficult to harvest, limited their viability as a food, feed, or fuel staple. The sequencing project identified more than 55,000 genes which instruct the building of proteins. It was also revealed that the species' genome originated from the merging of two closely related genomes more than 5 million years ago. By comparison, the genome of bread wheat emerged within just the last 6,000 years. The team also made a biochemical discovery that has never been reported in other plant species before. Proso millet, a C4 plant, has been found to use all three different biochemical paths to convert inorganic carbon into a useful form. Most C4 plants use just one of the three biochemical paths, with plant biologists only recently finding evidence of two paths in corn. For more details, read the news article in Nebraska Today. The annual area of ​​agricultural production in Thai Nguyen province is 92,141 ha, of which maize area is 20,144 ha. During the cultivation, borer and weed are factors limiting crop productivity. Measures of farmer to manage stem borers and weeds are still manual, costly and ineffective. Therefore, since introduction, transgenic insect resistant and glyphosate herbicide tolerance maize varieties were quickly accepted in local production. Up to now, the area of ​​transgenic maize has accounted for about 10% of the total annual maize area and tends to increase in the coming years. During the period 1995-2005, thanks to the application of new hybrid maize varieties and expanding areas, Vietnamese maize farming had spectacular growth when total production increased from more than 1 million tons / year to more than 4 million. tons / year. However, the increase in production of less than 5% in recent years has shown that traditional hybrids have reached the critical level of productivity. Meanwhile, although the domestic production of maize has increased but still cannot meet the domestic demand, maize has always been one of the most imported agricultural products into Vietnam in the last 10 years. With the current area of ​​cultivated land, the application of new generation maize varieties to help preserve productivity and raise income will be an important solution for farmers to continue to choose maize as a key crop. "We don't find any problem with Bt brinjal," said Bangladesh Agriculture Minister Dr. Abdur Razzaque when he addressed more than 160 guests at a policy workshop titled Agricultural Transformation in Bangladesh: Evidence on Biotechnology and Nutrition-Sensitive Agriculture at Hotel Intercontinental Dhaka on March 6, 2019. The Agriculture Minister also said that the government has come up with hybrid varieties including GMOs to ensure availability of safe and nutritious food. He said the adoption of Bt brinjal is a success story of the government of Bangladesh. The event was organized by the Ministry of Agriculture, and Bangladesh Policy Research and Strategy Support Program (PRSSP) of the International Food Policy Research Institute (IFPRI). Dr. Akhter Ahmed, IFPRI country representative in Bangladesh, presented the impact of Bt Brinjal technology in the country. A study conducted by IFPRI study reports that Bt brinjal farmers significantly reduced applications and amount of pesticide sprayed while fruit and shoot borer infestation was nearly eliminated among Bt brinjal plants. Planting the crop also reduced production costs, the report said, adding that Bt brinjal yield increased by 40 percent. For more details, read the articles in the Daily Sun and IFPRI. The vitamin A-enriched rice known as Golden Rice will soon be available in Bangladesh, according to Agriculture Minister Dr. Abdur Razzaque. He said this to news reporters after a meeting with the officials of the International Rice Research Institute. According to the World Health Organization, one in every 5 pre-school children in Bangladesh is vitamin A-deficient, while 23.7 percent of pregnant women have vitamin-A deficiency. 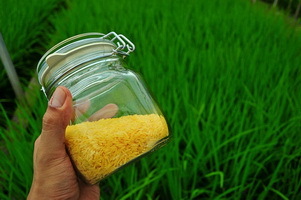 "Golden rice is more important than other varieties as it will help fight Vitamin A deficiency. The rice variety has already got clearance in USA, Canada and Australia… A committee of the environment ministry will give clearance to the rice for production. We will be able to start cultivation in Bangladesh within two to three months upon getting the clearance," he said. High grain yield is a key desirable trait in cereal crops. Floret fertility determines the number of grains per inflorescence (referred to as spike) of cereals such as bread wheat or barley. However, little was known about its genetic basis. A group of researchers from Japan, Germany, and Israel have now collaborated to decode the genetic basis of floret infertility in wheat. The group focused on the quantitative trait loci (QTL) responsible for enhanced grain number per spikelet, which was previously identified by a genomewide association analysis of European winter bread wheat. They mapped the QTL and identified the gene Grain Number Increase 1 (GNI-A1), which evolved in the Triticeae tribe through gene duplication, on chromosome arm 2AL. The scientists showed that the resulting GNI-A1 encoded a homeodomain leucine zipper class I (HD-Zip I) transcription factor, which inhibited the growth and development of wheat florets within the spikelets. In the domestication process, a decrease of GNI1 expression led to more fertile florets and an increase in grains per spikelet. However, additional analysis of high-yielding bread wheat cultivars revealed a reduced-function allele of the GNI-A1 gene. This mutated allele was found in modern wheat with higher floret fertility. This implies that the mutated allele increased floret fertility and that a selection for wheat cultivars carrying the reduced-function allele had taken place during further wheat-domestication. For more details, read the press release from Leibniz Institute of Plant Genetics and Crop Plant Research (IPK). The Brassicaceae family has a stunning diversity of fruit shapes, and in this family, the heart-shaped seed pods of the Capsella genus stand out. Eight million years ago, Capsella embarked on a different evolutionary pathway from its close relatives Arabidopsis and Camelina. This led to different shapes in the fruits which in these plants form pods enclosing the seeds before dispersal. Arabidopsis fruits are cylindrical, Camelina's are spherical, while the Capsella's are heart-shaped. A research team from John Innes Centre (JIC) used gene editing technology, transgenic plants, and molecular reporting techniques to show that the gene INDEHISCENT (IND) lay at the heart of the matter. In Arabidopsis, this gene is found only in strips of cells that regulate seed dispersal or pod shatter. However, in Capsella, IND has expanded local expression into the upper part of the valves, the shoulders that give the plant its characteristic heart shaped fruits. The gene-edited mutant Capsella without the IND gene showed significantly reduced shoulders compared to the wild type. Previous studies have showed that IND regulates the plant hormone auxin. JIC Prof. Lars Ostergaard said that while IND is important for the Capsella fruit shape, it mediates its effects by directly upregulating auxin biosynthesis in these pods to pilot growth. Read more details in the JIC press release. Phytophthora root and stem rot (PRR) is a devastating disease in soybean caused by Phytophthora sojae, a soil-borne water mold. P. sojae races are highly diverse and variable, thus controlling it is very challenging. Scientist from Jilin Academy of Agricultural Sciences in China reported successful introduction of harpinXooc-encoding hrf2 gene from rice bacterial pathogen Xanthomonas oryzae pv. oryzicola in soybean which improved resistance to P. sojae. The results are published in Transgenic Research. Molecular tests confirmed the expression of hrf2 in transgenic soybean plants. After exposure to P. sojae, the non-transgenic control plants showed PRR symptoms such as necrotic and wilting leaves, and plant death; while the transgenic plants had slight chlorotic leaves but with normal development. In the T3 to T5 generations, the transgenic plants exhibited milder PRR symptoms and higher survival rates than the control. The transgenic plants also exhibited significant upregulations of plant defense-related genes such as salicylic acid- and jasmonic acid-dependent and hypersensitive response-related genes. Non-transgenic and transgenic plants that were not exposed to P. sojae had so significant differences in agronomic characteristic. Based on the results, hrf2 expression in transgenic soybean significantly improved the resistance of soybean to P. sojae. RNA binding proteins (RBPs) have essential roles in posttranscriptional gene regulation, however, such functions are yet to be explained. Thus, scientists from China Agricultural University and Shanghai University conducted a study to elucidate the function of one RBP (DEK42) in maize. Dek42 is continuously expressed in the different tissues of maize. When this gene was mutated, there was a significant decrease in the build up BEK42 protein in mutant kernels. Analysis showed that the dek42 mutation changed the expression of thousands of genes during the development of maize kernel. Further analysis also showed that the dek42 mutation significantly changed alternative splicing in expressed genes, which were especially enriched for the U12‐type intron retained type. The findings imply that DEK42 is vital in the regulation of pre-mRA splicing through its interaction with other spliceosome components. Read more from the Journal of Integrative Plant Biology. Various genetic engineering techniques has proven to be beneficial to food and agricultural industry by improving agronomic characteristics. Genome editing tools such as siRNA-mediated RNA interference for targeted suppression of gene expression and transcription activator-like effector nucleases (TALENs) and zinc-finger nucleases (ZFNs) for DNA repair have been extensively used commercially. With the advent of CRISPR-Cas9 system, genome editing has been revolutionized. Experts from University of Campinas in Brazil, together with other researchers in Taiwan, Spain, Greece, and Denmark, reviewed the progress of CRISPR-Cas9 applications in food and agriculture, particularly in the development of resistant crops with enhanced quality and productivity. Their paper is published in Biotechnology Advances. CRISPR-Cas9 system is faster, easier, more precise and cheaper compared to the conventional methods. CRISPR-Cas9 technology could be used to improve the productivity of fermentation process. There is no clear mechanism of Cas9 from designed sgRNA and consequent recycle. Multiple sgRNAs+delivery system allows possibilities for gene clusters deletion. Download the full paper in Biotechnology Advances. The genome editing tool CRISPR has transformed many areas of biology, but using it to enhance crops such as wheat and corn remains difficult because of the plants' tough cell walls. Now, a team of researchers has creatively solved that problem by using pollen from one genetically modified (GM) plant to carry CRISPR's components into another plant's cells. The researchers used haploid induction, an odd phenomenon which allows pollen to fertilize plants without permanently transferring male genetic material to offspring. The new plants only have a female set of chromosomes, which makes them haploid instead of the traditional diploid. The research team used a corn line that can be transformed with CRISPR using bacteria or gene gun technology, and that has a crippled version of a gene, MATRILINEAL, making its pollen able to trigger haploid induction. They then transformed this corn line with a gRNA/Cas9 combinations programmed to target genes related to different desirable traits. The pollen of these transformed plants could then spread the gRNA and Cas9 editing machinery to other corn varieties that had been recalcitrant to CRISPR. This haploid induction-edit (HI-edit), as the researchers call the CRISPR pollen method, has only been done in laboratories. However, the researchers say that if it were done in the field, the changes would not spread because the male genome in the pollen disappears shortly after fertilization. For more details, read the news article in Science. Researchers at the University of Wisconsin hope to turn woody plants into a replacement for petroleum in producing fuels and other chemicals and are after the sugars in cellulose that makes up much of plant cell walls. Getting those sugars involves stripping away lignin, the polymer that fills the gaps between cellulose and other chemical components in cell walls. Lignin never carried much value, and lignin stripped from wood to make paper is simply burned. Enter the bacterium Novosphingobium aromaticivorans, a biological funnel for the aromatics in lignin, and which can digest nearly all of the different pieces of lignin into smaller hydrocarbons. During digestion, the microbe turns aromatic compounds into 2-pyrone-4,6-dicarboxylic acid (PDC). By removing three genes from the microbe, the intermediate PDC comes to the end of the line. These engineered bacteria became a funnel where lignin pieces go, and out of which PDC flows. The researchers found that PDC performs the same or better than most common petroleum-based additive to PET polymers such as plastic bottles and synthetic fibers. Read more details in University of Wisconsin News. Scientists from the University of Berkeley in California have genetically engineered brewer's yeast to create cannabinoids -- the active ingredients found in cannabis plants. The fermentation process transforms the altered yeast into tetrahydrocannabinol (THC) and cannabidiol (CBD), the major cannabinoids which are known for its medicinal and potential therapeutic properties. The team needed to create 16 genetic modifications to transform galactose, a sugar found in yeast, into inactive forms of THC or CBD. Heating the cannabinoids shifts them into their active forms. They were also able to convert different fatty acids into cannabinoids that do not occur naturally in nature from the engineered yeast. For more details, read the news article in Nature. 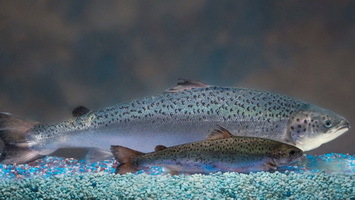 The U.S. Food and Drug Administration (FDA) released a statement on March 8, 2019 saying that the agency has deactivated an import alert implemented in 2016 that prevented the entry of genetically modified (GE) salmon. During that same year, U.S. Congress instructed the FDA not to let the GE salmon enter the country pending the final labeling guidelines. This directive was given despite FDA's comprehensive analysis of the GE salmon's scientific evidence that proved its safety as food. FDA obliged to Congress' directions by issuing the 2016 import alert. The deactivation of the said import alert came after the U.S. Department of Agriculture's (USDA) announcement in December 2018 on the National Bioengineered Food Disclosure Standard, which requires food manufacturers, importers and retailers to appropriately disclose bioengineered foods. With the USDA issuing and effectively carrying out the food disclosure standard, FDA believes that USDA has satisfied Congress' mandate and has therefore ceased the implementation of their 2016 import alert. This now enables the GE salmon, including salmon eggs used to grow the fish, to enter the U.S.
FDA pointed out their 2015 review findings that the GE salmon is safe to eat, and that it will not cause significant impact to the environment. The agency also encourages other developers of products derived from intentional genetic alterations to approach and work with them during the early part of their product research to determine a predictable and efficient way to regulatory approval. 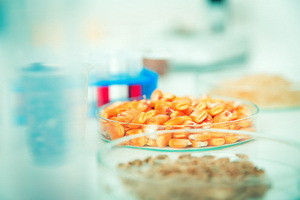 Read the FDA's statement, and USDA's announcement on National Bioengineered Food Disclosure Standard for more details.